Benin City — A medical practitioner and consultant at Irrua Teaching Hospital, Dr. Abubakar Muhammed, has said that Lassa fever infected 4,000 persons in Nigeria, noting that there was need for more enlightenment on the dangers of the deadly virus. 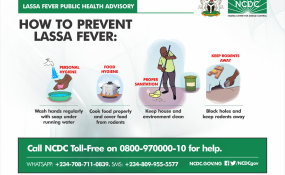 Muhammed, who disclosed this at the annual prayer get together party organised by the Auchi Indigenes Club, said the only way to avoid the virus is to have access to information about Lassa fever. He challenged relevant stakeholders to take the campaign seriously as this would lead to behavioural and attitudinal change in curbing the spread of the disease. He said: "ln Sweden, like other Scandinavian countries, their health indexes is so high, life expectancy over 80 years. The difference is information; we must have the information first before we think of the health facilities and others. That is why we must know what Lassa fever is today. Lassa fever is endemic in our areas, and Edo State falls along the Lassa fever birth". "It is vital to know what Lassa fever is, how to contact it, and the common symptoms that are associated to the disease like malaria fever. Beyond that, Lassa fever is an acute viral fever." "What Lassa fever means generally is an increase in body temperature. The problem with the virus is that they are very difficult to handle. We do not have treatment to cure the virus but it kills easily. "The good thing is that more than 80% of people who come in contact with this disease may not manifest any symptoms, while 20% will develop serious symptoms and 1% will die. The worst aspect is cases of pregnant women." Muhammed however, outlined some of the symptoms to include regular vomiting, deafness, body weakness, increase in body temperature, headache, sour throat, hearing impairment among others. In his remarks, the Chairman of Auchi Indigenes club, Alhaji Ikharo Duada, said the essence of the reunion party is to thank God for promoting their members in various careers who distinguished themselves.